Mollie Makes is the UK's premier lifestyle and craft magazine, perhaps their answer to Martha Stewart, but without the attitude! 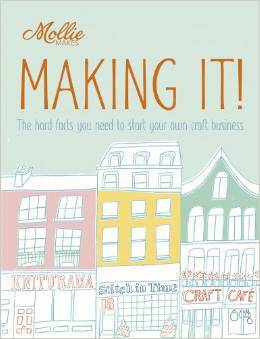 Mollie Makes Making It is a guide for everyone who has ever thought about combining her love of an art form with a successful business. Does the idea of keeping records,pricing, marketing, and selling leave you weak in the knees? Then MMMI might be just what you need to take stock and consider moving forward. The resources are heavily weighted towards the UK, just so you know, but there are easily-found US equivalents to most of them. Perhaps you want to earn some 'pin money', so that you can buy materials to do yet more crafting and make your hobby self-financing Perhaps your home is bursting at the seams with all the things you've made and you desperately need to sell some of them in order to clear some space? Or perhaps you want to turn your crafting into a full-time business? This guide speaks to all of those motivations. It gives you advice on identifying and finding your customers, branding your products, approaching retailers, gaining publicity, and using social media. There are sections on legal issues, basic accounting, and also inspirational case studies of people who have "made it"!